I have a weird issue with Chrome (69.0.3497.92 (Official Build) (64-bit)). When I go into fullscreen mode with CMD + CTRL + F the addressbar disappears. It started after the update from the old known theme to the 'new' flat Chrome version. I cannot browse to URLs in fullscreen mode anymore. To make it completely clear. It is not with the video based fullscreen etc. it concerns every page. In the drop-down menu that appears, click "Always show toolbar in full screen"
search for: "UI Layout for the browser’s top chrome"
Change to "normal" then restart the browser. Then I had tabs and address bar. I've been having the same issue with my chrome and its been driving me insane. I found another google forum where someone was talking about removing the address bar, so I tried the steps in reverse. What I did was go to the view option in the status bar, made sure "always show toolbar in full screen" was checked, went into full-screen mode, saw it was still checked, uncheck it and recheck it, and the address back came back!. This worked for me pretty well, and hopefully, it'll help you out as well. Have a nice day! Click "Exit Full Screen" in the "View" menu. If the window is not fully maximized, use the mouse to expand the window to the edges of the screen, with the top border to just below the toolbar. It might have been fixed in version 70 as I use version 71.0.3578.98 (Official Build) (64-bit) for 2 weeks now and I haven't experienced failures. Update (March 17th): I haven't had any issues whatsoever, so it seems to be fixed. In full screen, do any of the following: Show and hide the menu bar: Move the pointer to or away from the top of the screen to access the app’s menus. Maximize the window by pressing and holding the Option key while you click the green maximize button . The window expands, but the menu bar and the Dock remain visible. To return to the previous window size, Option-click the button again. Or to expand the window to the full width and height of the screen while still showing the menu bar, hold SHIFT + ALT/OPTION while clicking the green maximize button. Not the answer you're looking for? Browse other questions tagged high-sierra google-chrome fullscreen . 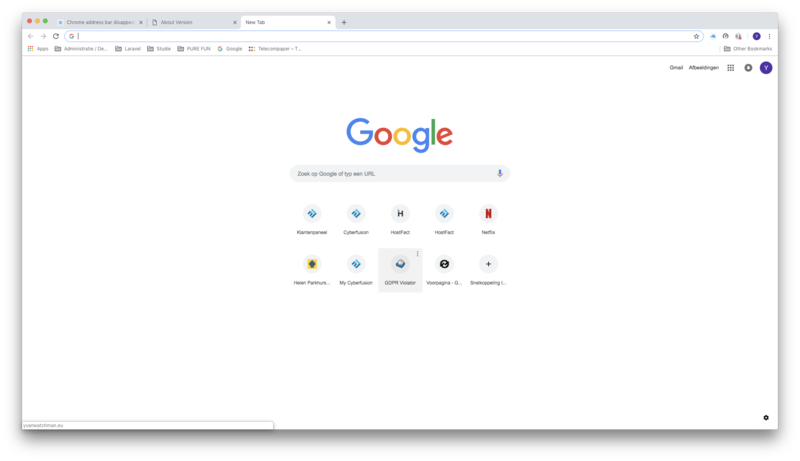 Chrome: Keyboard shortcut to leave address bar and focus browsing area? How do I get F6 on a Mac to click into the address bar on Chrome?